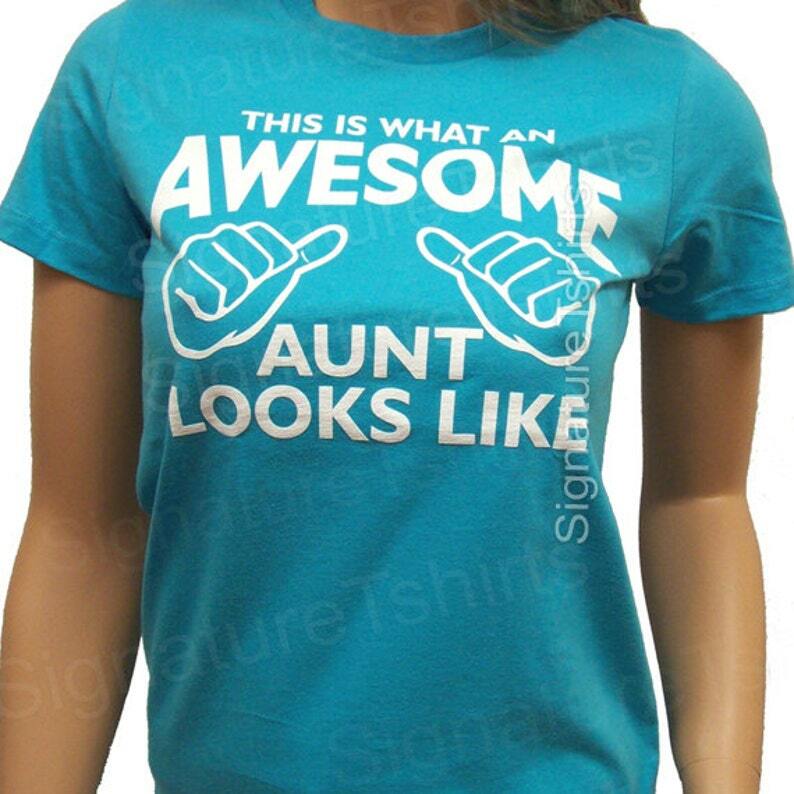 This is what an Awesome Aunt Looks like tshirt ladies juniors fit T-shirt is made of 100% combed ringspun cotton, flattering cut, super soft. PLEASE CHOOSE SIZE, COLOR AND STYLE (womens or unisex) on CHECKOUT! This is fitted shirt, please check sizing chart! Please choose desired color and size on CHECKOUT or from drop down menu or write message in your order. There is nothing on the back of T-Shirt. SHIPPING: This item will be shipped within 4-7 business days after the payment is received. Small: Length 25 3⁄8" - Chest 32 1⁄2"
Medium: Length 26" - Chest 34 1⁄2"
Large: Length 26 5⁄8" - Chest 36 1⁄2"
XL: Length 27 1⁄4" - Chest 39 1⁄2 "
2XL: Length 27 7⁄8" - Chest 42 1⁄2"
2XL: Length 32 - Width 26"
Please check sizes carefully and order size larger, if needed. Chest is measured 1" below armhole. Body length in the front from highest point of shoulder. Sleeve length from shoulder edge. Please contact us for other available t-shirt colors. We will accept Credit Card and PayPal payments. Bank-transfers, money orders and personal checks are not accepted at this time. We will gladly exchange a shirt for a different size if the original, unworn/washed shirt is sent back to us within 7 days of receiving order. Please contact us for return address. Since all our t-shirts are made to order we will not accept returns for refund. ALL SALES ARE FINAL! Current processing time after payment is received is 3-9 days. Items are made to order. Please contact us if you need items delivered by certain date. We will try to accommodate every request. We ship single shirts using USPS First-Class or USPS First-Class International by default. If you need faster shipping please purchase shipping upgrade on checkout (drop down menu). We also offer additional USPS services - like "insurance" and "signature confirmation" on checkout (additional cost apply). Multiple t-shirt and sweatshirt orders will be shipped USPS Priority with insurance (included in price). We'll send tracking/delivery confirmation after we ship item via Conversations or at your Pay Pal email address. PLEASE CHECK YOUR ORDER AND SHIPPING ADDRESS IN FILE! We will ship your order to address you left during checkout. We are not responsible if you left incorrect shipping address and package wasn't delivered on time. You can contact us, no later then 2-3 hours after purchase, only on ETSY convos (not email), if you want package to be shipped to another address. If package returns due to incorrect or incomplete shipping address, buyer will be responsible for shipping charges for reshipping item . Please contact us prior your purchase if you need item by certain date. There is no guarantee for First class and Priority mail delivery date - it's just estimated by Post office website. We can guarantee delivery time only for Express mail orders. International orders can take up to 4-6 weeks (additional week in holiday time) to clear customs and be delivered. Customer is responsible for any additional fees/charges assessed by the local shipping carrier, customs etc. We have faster shipping offered on listing for additional cost. If you need help finding it, please contact us on convos. Please contact us if you need anything special or you want to buy more than 10 t-shirts... In that case (large orders) we will give you discount for shipping. We are currently working on our new shop Drop it like a squat - will post link when we finish. Thanks for supporting us.